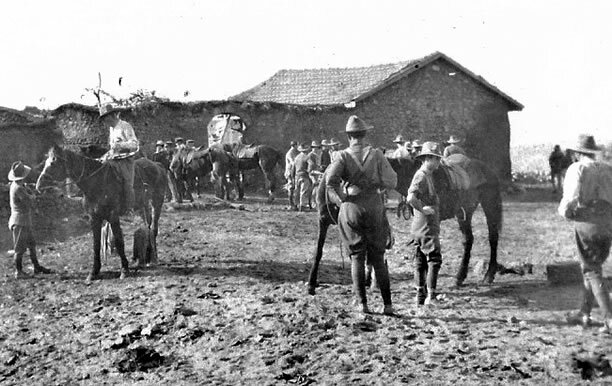 Relations between the Anzac Mounted Division and Palestinian Arabs reached a new low early on 10 December 1918, when Trooper Leslie Lowry was shot dead after disturbing a thief in his tent. That night a large group of New Zealanders and Australians exacted vigilante justice, burning the nearby Arab village of Sarafand al-Amar (Surafend) to the ground and killing around 40 male inhabitants. The Anzacs refused to cooperate with the subsequent British investigation, leading General Allenby to condemn them as ‘a lot of cowards and murderers’. The village was later rebuilt by the British Army, with Australia and New Zealand contributing to the cost. We have 19 biographies, 40 articles, related to Anzac troops take revenge on Arab civilians at Surafend.